Jerusalem Falls to British, "Great Rejoicing in the Christian World"
Reporting two days later about General Edmund Allenby's conquest of Jerusalem on December 9, 1917, the New York Herald announced in a headline: "Jerusalem Rescued by British after 673 Years of Moslem Rule." Subtitles then elaborate: "Great Rejoicing in the Christian World" and "Jews Everywhere in Particular See the Restoration of Palestine as Part of Allies' Programme." First page - click for enlargement. The math checks out: 1917-673=1244, the year when the Ayyubids, with Khwarezmian aid, seized the city for the last time from the Crusaders. 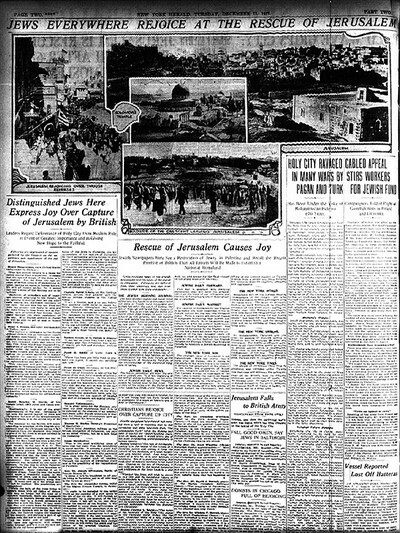 The newspaper's second page boasts stories under headlines that read "Distinguished Jews Here [i.e., New York] Express Joy Over Capture of Jerusalem by British," "Rescue of Jerusalem Causes Joy," and "Holy City Ravaged in Many Wars by Pagan and Turk: Has Been Under the Yoke of Mohammedan Rule for 670 Years." Second page - click for enlargement. 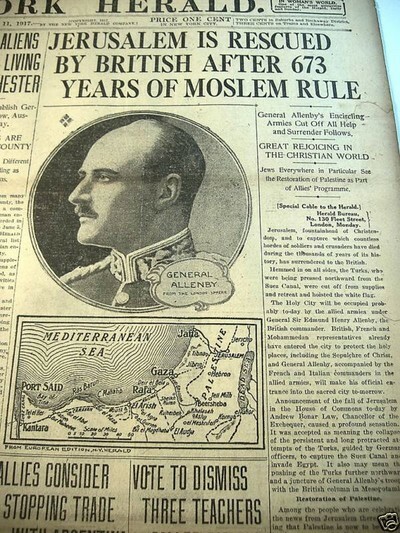 (1) The lead headline captures a mentality once dominant but now rare in the West, when there was a self-conscious "Christian world" and it rejoiced in a religious/military victory over Muslims. (2) Conversely, the "Muslim world" would still today rejoice in precisely this manner, recalling medieval rivalries, raising religious sentiments, and taking satisfaction at the humiliation of an age-old enemy. 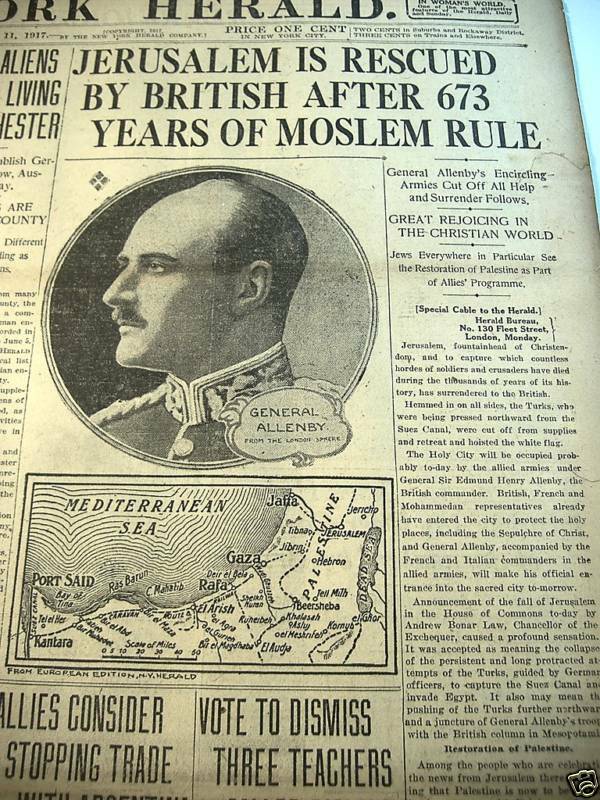 (3) If the West can travel so far in less than a century, why not Muslims as well? Mar. 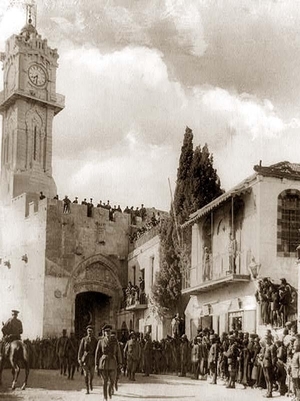 24, 2014 update: A 14-minute film, General Allenby's Entry into Jerusalem, is available to view, courtesy of the UK Imperial War Museum.